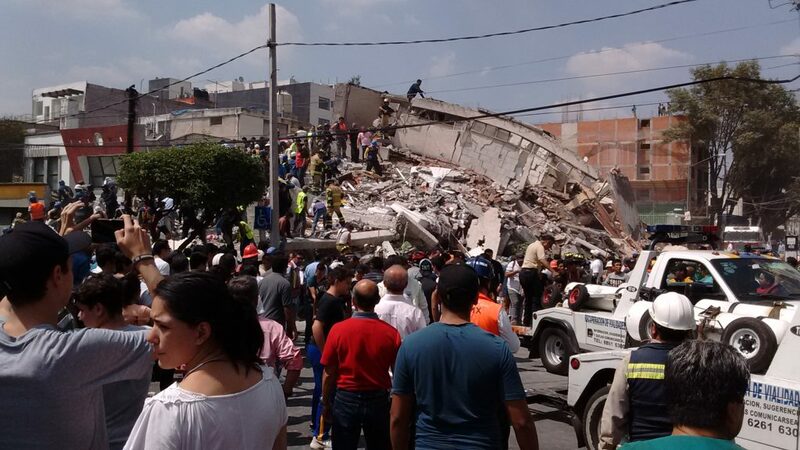 16 May 2018–Last September’s magnitude 8.2 Tehuantepec earthquake and the magnitude 7.1 Puebla-Morelos earthquakes in Mexico led to an intense period of study for Latin American seismologists, with new research on everything from strong motion records to tsunamis generated by the two significant events. The 2018 SSA Annual Meeting devoted two full sessions to research on the events, with numerous other talks and posters related to the Mexico earthquakes presented in Miami. The September 19 M7.1 earthquake in Mexico City collapsed 43 buildings between one and 10 stories on the western edge of the lake bed sediments that underlie the city. Victor Cruz-Atienza of Universidad Nacional Autónoma de México (UNAM) and colleagues presented data (also discussed in a recent paper in the journal Nature) explaining why this damaging pattern may have occurred. Their models and 3-D simulation show that seismic energy can propagate through long distances in the deep structure of the Mexico City Valley, and that the seismic response of the basin is dominated by surface-waves that increase the duration of shaking, leading to prolonged and devastating shaking. Both of the September earthquakes were intraslab earthquakes, meaning the ruptures originated within the Cocos slab that has dipped below Mexico as part of the subduction zone off the country’s west coast. Diego Melgar of the University of Oregon and colleagues show that pre-existing “textures” in this seafloor slab, including small hills, folds and faults that had formed on the original seafloor, played a role in faulting during the September quakes. Melgar and colleagues have published some of their findings in Geophysical Research Letters. The September 8 earthquake and its aftershocks follow a pattern of deformation that suggests the earthquake may have occurred as a result of the downgoing slab detaching under its own gravitational weight, pulling it away from the subduction zone contact between the Cocos and North American tectonic plates, according to work presented by Gerardo Suarez of UNAM and colleagues. This earthquake, along with other large earthquakes in the region in 1931 and 1999, also show this pattern of slab detachment. The detachment may mean that the interface between the Cocos and North American plates is locked, possibly building up stress at the interface that could be released in a large earthquake. Could the September 19 earthquake be considered an aftershock of the September 8 quake? In his meeting presentation, Eric Fielding of the NASA Jet Propulsion Laboratory noted that there were also two other magnitude 6.1 earthquakes in Mexico that took place after the September 8 earthquake that could be considered its aftershocks, since they occurred soon after the earthquake within 200 kilometers of the main rupture. The September 19 earthquake does not meet the criteria for being an aftershock of the September 8 quake, but may have been affected by slab stresses produced by that earthquake.